In war torn England the battle lines between Saxon and Norman are clearly drawn. The Saxons must fight for everything they have in the hopes of winning their country back from the Normans who are determined to break their resistance. Rowena Godwinson, the sole remaining member of the defeated royal family, stands proudly against the Normans that would trample them underfoot but her nobility and grace make her an ideal pawn in the Norman King William’s play for power with the Saxon people. When he decrees she marry a powerful Norman knight, her subjugation appears to be complete. The handsome soldier with the kind brown eyes and gentle touch is a threat to her determination to defy the interlopers. Can she hold firm to her Saxon heritage and refuse to give in to his advances? John of Normandy wants only to prove himself worthy of the king’s trust. He is rewarded for his service and loyalty with land, titles and a Saxon beauty for a bride. John balks at the marriage, driven by the secret guilt of knowing Rowena’s father died at his sword. However, John’s reluctance is soon replaced by a burning desire to please this woman and win her over as well as her people. John stood in the doorway handsomely dressed as befit the new Lord of Essex. Rowena’s breath caught in her throat. She looked away before the immense pleasure she felt at his return showed on her face. Joan quickly gathered her sewing and removed herself from the room, closing the door behind her. Rowena went to him and helped him remove his surcoat before seeing to the heavier chainmail. He smelled of horses and leather. Manly. Rowena tried not to close her eyes as she drank in the intoxicating smell of him. Why would a dirty, sweaty man make her feel so light headed? She stepped away when she realized why, the chainmail slipping forward off his arms. His hooded eyes told her that he knew what she was feeling. “Is there a problem?” His deep voice seemed to reverberate through her body. Rowena froze with her hand on the latch and heard him coming toward her. He stood close behind, his breath soft against her cheek. “Yes?” Be done with this. Her body yearned for his arms to pull her against him, to feel his kiss again. She licked her lips. Rowena felt only slightly guilty when he turned away from her, standing like a lost little boy in the middle of the room. The Saxon Bride is available at Amazon. Ashley York loves to hear from her fans. Email her at ashleyyorkauthor@gmail.com. Visit her website www.ashleyyorkauthor.com. She’s also on Facebook and Twitter. Thank you for visiting, Ashley. 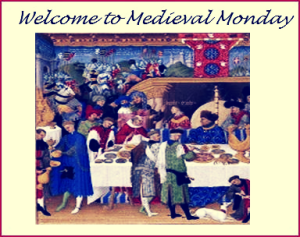 If you want to find more Medieval Monday posts, check my archives and come back next week.